Pinnacle Custom Signs provides sign services and products for the business community to enhance your visibility and your ROI. Get more information or request a quote today! Trade shows are big business in the United States. Over $25 Billion dollars is spent each year on trade shows, business expos, conventions, and conferences for businesses. Furthermore, 92% of trade show attendees say their main reason for attending trade shows is to see new products or meet new potential business partners/customers. Maybe that is because over 81% of the people who attend tradeshows are the actual decision makers. When exhibiting trade shows, participants also stated that an eye-catching stand is the most effective method attracting attendees according to 48% of those surveyed. That is why the team at Pinnacle works so diligently with our clients to make sure that their trade show displays convey the right message to attract the right attendees. 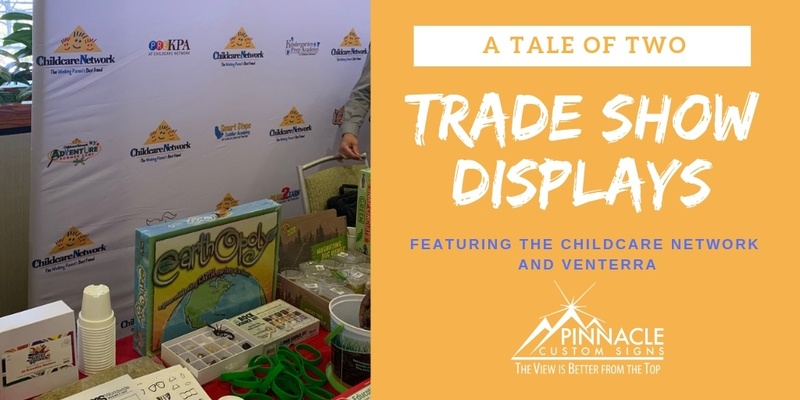 We recently had the opportunity to work on two different sets of products for trade shows to help promote the Childcare Network and our own company at the recent Venterra Leadership Conference. The Childcare Network is currently going through a rebranding effort as an organization and has been updating its signage nationwide. After doing some smaller sign projects for the company, we had the opportunity to meet with their Operations Support Manager and the School Achievement Manager. The company was hosting a trade show near the Airport in Atlanta and Pinnacle agreed to sponsor the event by providing part of their signage as an in-kind donation. 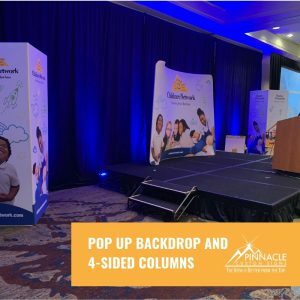 We worked with the Childcare Network to produce a pop-up fabric backdrop display and two box-style pop-ups with four-sided branding for the stage area. 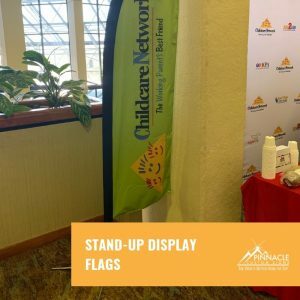 We also worked with them to produce flag banners and a step and repeat backdrop for the event for both the Childcare Network brand and the Sunrise Preschool Brand. We utilized artwork provided by the client for this project and incorporated it onto the signage used throughout the event. 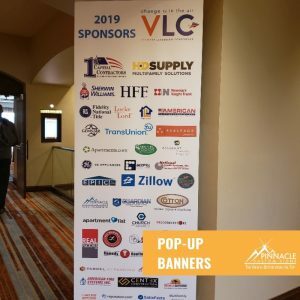 With the Venterra Leadership Conference Trade Show, Pinnacle agreed to sponsor the event in order to have the opportunity to meet the entire Venterra Network and showcase our own services. As part of the trade show sponsorship, we provided step and repeat banners along with pull-up banners and easel display signs. 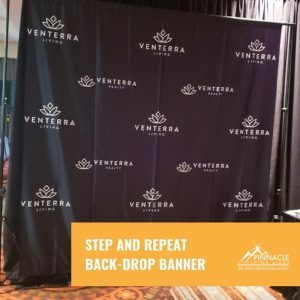 The items we created for Venterra at the trade show were designed to be reusable for multiple functions. The company contacts appreciated the fact that our in-kind items gave them a larger ROI for use beyond the actual tradeshow. Our decision to participate in this show was based on our years of working with the company in the southeastern market. Pinnacle has had the opportunity to work with several of the company’s properties to provide monument, lobby, and outdoor signage. By participating in the conference, we got to showcase our nationwide capabilities to all of their decision makers. In each of these projects, Pinnacle chose to work with the client because it was a strategic investment in our potential to market ourselves to new markets. However, the key difference in these two shows is the items that were utilized to make the trade show displays resonate with attendees. With the large impact that a well-crafted trade show display can have on meeting potential new clients and vendors, it is important to make your display impress. From branded tablecloths to elaborate interlocking backdrops – your next trade show can set you apart from other exhibitors. Just give us a call to start the discussion before your next event. Use the form below to send us details about what you need; we'll get in contact with you. At Pinnacle Custom Signs, it is our personal goal to be our customer’s first choice for all their signage needs. We are focused on delivering outstanding customer service and high quality products. That’s just what we do. No gimmicks – just great products and great customer service. Copyright © 2019 · Pinnacle Custom Signs. All Rights Reserved.